He presented another parable to them, saying, "The kingdom of heaven may be compared to a man who sowed good seed in his field. But while men were sleeping, his enemy came and sowed tares also among the wheat, and went away. But when the wheat sprang up and bore grain, then the tares became evident also. "But he said, 'No; lest while you are gathering up the tares, you may root up the wheat with them. 'Allow both to grow together until the harvest; and in the time of the harvest I will say to the reapers, "first gather up the tares and blind them in bundles to burn them up; but gather the wheat into my barn."'" Too cute! Hopefully my kid won't need 'em... Thanks! Thanks so much for this. Having had four kids go through braces this will come in handy. Thank you so much for this Freebie. I want to let you know that I posted a link to your blog in CBH Digital Scrapbooking Freebies, under the Page 14 post on Dec. 02, 2009. Thanks again. Something totally different but specifically useful makes a world of difference . . 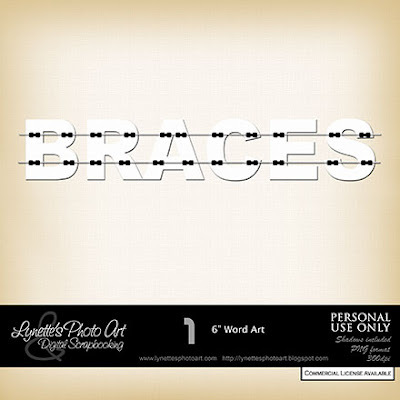 I am not sure but the braces might also work for train tracks.